When we think of wind turbines we either think large scale wind farm infrastructures or a miniature tri-propeller consumer version. With product design at the heart of its innovation, NEWWIND are taking a completely unique approach. By combining their micro-electricity technology with a multitude of micro turbines they have developed the AEROLEAF. 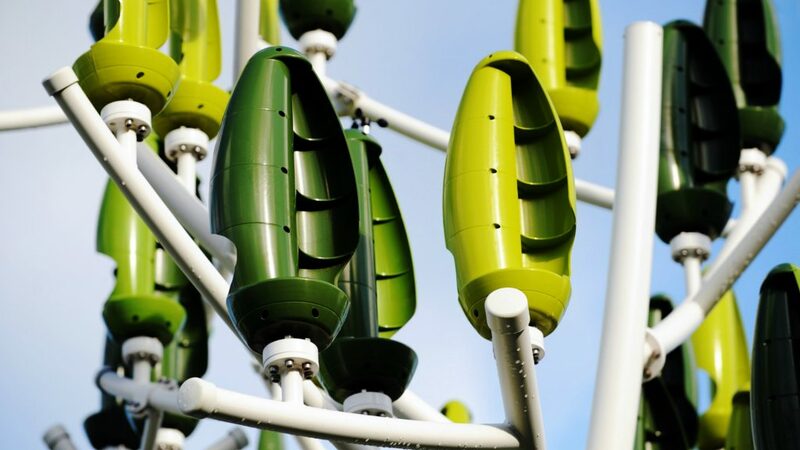 At first glance the product design of the AEROLEAF is more sculptural than a primary electricity generating structure. Making it appropriate for our urban landscape with the benefit of generating electricity closer to the users. It can be plugged into the public grid, or used to supplement the power of a particular building or complex. Overall size is about the same as a real tree at 12 m (36 ft) tall by 8 m (26 ft) in diameter with 72 turbines. The structure is made entirely of steel allowing all the cables and generators to be concealed inside the structure keeping its appearance clean but yet durable. Spinning on a vertical axis the pod/cocoon shaped turbines are compact and durable for the elements. Because each one has little mass, they can generate power with a gentle breeze which allows them to generate electricity more days of the year. 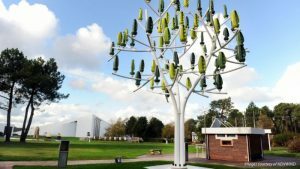 One wind tree can approximately power 15 street lamps, lights for 10,000 sq ft of office space or 80% of an average families home (not including the heating). Most importantly, it avoids 3.2 tons of CO2 on 2,400 kWh of electricity produced by an oil-fired power plant. Here in Vancouver these would be a great addition where our average wind speeds are low and at times fickle (not strong enough for large turbines). AEROLEAF could very easily fit into just about any of our public space from urban streetscapes to our city parks. Need assistance in turning your idea into a real product? We help our clients in all areas of product design. Call us today at 604.876.0073 or email us at info@whiteboxdesign.com.